How do you define a “leading lady”? Literally, it means the primary female character in a film whom the story either pivots around or is driven by. Symbolically, though, most expect the leading lady to be a unique individual who stands out in personality; someone who is representative of either girls or women so authentic that they resonate with audiences, or they’re so outlandlishly rare that they remain truly memorable for their alien-like ways. Either way they are meant to leave a lasting effect. Unfortunately, the symbolic point of a leading lady is usually lost in today’s hero-centric Kollywood industry. In most Tamil films releasing these days the sole purpose of the leading lady is to be the object of affection for a memorable hero, with little ingredients to make her individually interesting on her own merit. There are of course, thankfully, exceptions to this formula, even amongst some mainstream commercial action films, but generally speaking, it’s rare that we see valiant female characters (aka true ‘heroines’) unless the film is a relationship-based romance. And, even in this genre in Tamil cinema, the story is often narrated from a male perspective – it’s about how he met the girl of his dreams, or how he fought for their love or how he transitioned from a boyfriend to a husband, etc. Again, there are exceptions and directors who even the playing field, but quite often in the romance genre we still leave the theatre sympathizing with, or falling harder for, the on-screen Romeo. The consistent exception to these rules is of course Mani Ratnam – a director and writer who always gives us both “pin up” guys and gals. With OK Kanmani promotions in full swing and much increasing excitement for an ultra urban romance from the man who gave us great love stories in films like Alaipayuthey, Aaytha Ezhuthu, Guru and Mouna Ragam (to name a few) it’s common for fans to reflect on some of Mani Ratnam’s ideal definitions of a ‘dream lover’. For most, that term automatically generates the image of Madhavan, clad in a green sweater and boyish grin, standing with outstretched arms. But what about Mani’s heroines? The truest type of leading ladies? They are daring and confident, informed and simultaneously innocent, beautiful in comfortable manners, and all-round unique individuals. They are dream girls of substance, strength and simplicity. They are the complete opposite of damsels in distress. They are chicks in charge. And now, it looks like we’re going to meet another one of them – by the name of Tara. Reflecting on some of Mani Ratnam’s past female romantic leads, even from just a small subset of his repertoire, there are many strong types of female loves we’ve seen whom Tara could be an extension of. We’ve seen confidence in characters like Aaytha Ezhuthu’s Gigi, who stands by her activist love, and in Sashi, who takes a stand by leaving a toxic relationship for the sake of her own well-being and that of her unborn child. We’ve met Shakthi (Alaipayuthey) and Shaila (Bombay), who struggled with their instincts to quietly obey their parents and those that told them that they might eventually be respected for their conviction in love. Years ago we got to know Roja, arguably Mani Ratnam’s most daring leading lady of all, who literally fought against terrorists to rescue her husband, in the ultimate of all Kollywood-movie role reversals. These formidably written female characters are each desirable in their own way – but are all linked in their appeal to audiences who appreciate authenticity and equality. By introducing the world to such characters Ratnam reminds us all to respect women for the independent, free-thinking and entirely capable equals that they are – those that have the ability to fall, win and/or fail in love, and life, just like any hero does. In fact, a recent International Women’s Day post by Madras Talkies to spotlight the many women who worked on OKK, reconfirms that Ratnam practices what he preaches. So with such formidably written female characters in past Madras Talkies romances – we can’t help but wonder: Who is Tara? How will she redefine the term of ‘dream girl’ for the current generation? In released clips we can very clearly see she is no demure lass. 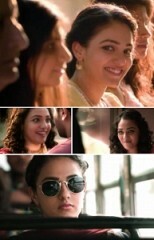 Portrayed by the luminous Nithya Menen we see signs of a character with an infectious personality and boundless energy. Scenes of her happily romancing her beau Aadhi, played by Dulquer Salmaan, imply a free-spirited woman who isn’t afraid to show affection or speak her mind. Aadhi believes it’s “OKK” not to get married, so is Tara the kind of open-minded heroine who feels the same way? Do the scenes that make it look like they’re sharing common living spaces together imply they are co-habitating without marriage, and, in that case, does this mean she is a more progressive woman? Or, as the trailer alludes when she playfully asks “Should I ask my mother to come tomorrow?” – is she the kind of gutsy girl who is confident she can change the opinion of her love and eventually opens up about where she thinks their relationship should actually go? Or is she the kind of risk taker who is merely teasing him, because she is willing to give their relationship a try knowing she may never get him down the aisle? Only time will tell exactly who Tara is, but from initial looks at Oh Kadhal Kanmani it can certainly be declared that she is another unforgettable dream girl. A new form of the realistic and admirable, Mani-Ratnam-written type of leading lady – the kind real women can relate to, and the kind real men fall for, both on and off the screen. Vairamuthu on his Ok Kanmani experience!